Today I am sharing some big news on the blog. 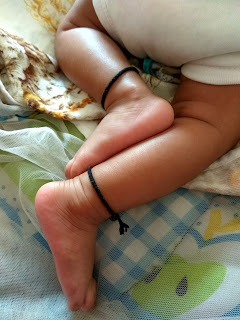 I delivered a baby girl last August! And as you would expect, life has been so busy. The word 'BUSY' post Motherhood has a totally different meaning. And while our heart has been full with all the love and affection, the blog definitely took a backseat during the last year. Go with the flow. Don't over plan! And hence, time and again I like to repeat this profound thought by Harivansh Rai Bacchan to myself. Aur Ishwar aapka accha chahega. It's good if things work out as per your plan. Till then I leave you with a few pictures I had clicked last February in Goa. I was 12 weeks pregnant then. Hope you like them. Hi guys. How are you doing? I know I have been irregular with my blogposts, but I am trying to change it and get back on track soon. Early this year, I had introduced you all to a brand that I had really fallen in love with. Palam silks had launched their Concert Collection for the Margazhi season, and I was totally floored. 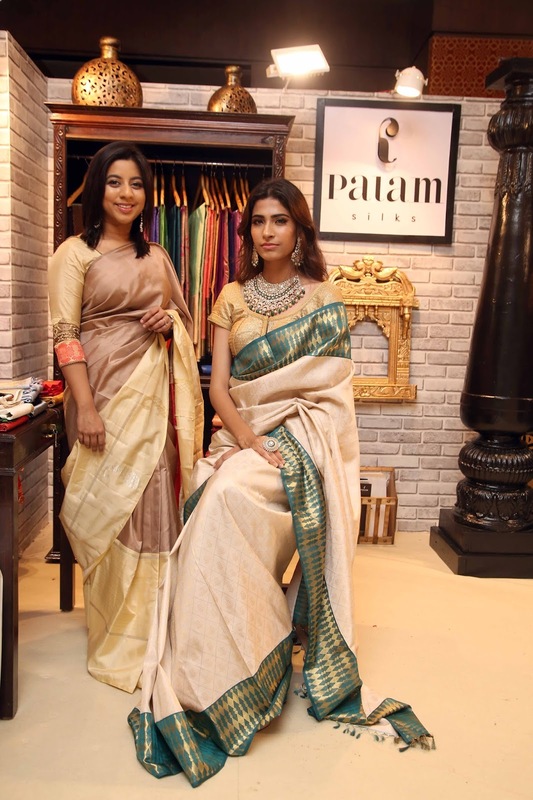 Palam has been imperative in giving a launchpad to weavers to showcase the designs. The thought behind their annual fashion show “Silkline” is more about adding a face to every saree that is featured on the ramp. Every weaver is formally felicitated on stage and this veneration has kept them motivated, to choose this art over an urban job chase. Now they felt, they need to recognise young designers to explore their designing skills on kanjeevarams. This project was always in the pipeline, and so they started off with their in-house designer who has been working under the shade of Palam for the past 5 years- Sunita Yogesh. SunitaYogesh, is the daughter of Jeyasree Ravi of Palam Silks. A Chartered Accountant's degree and MBA from IIM did not stop Sunita from pursuing her passion for design and art. She pursued surface pattern designing course from Central Saint Martins in London and also worked with artisans from Rajasthan on the traditional art of hand block prints. 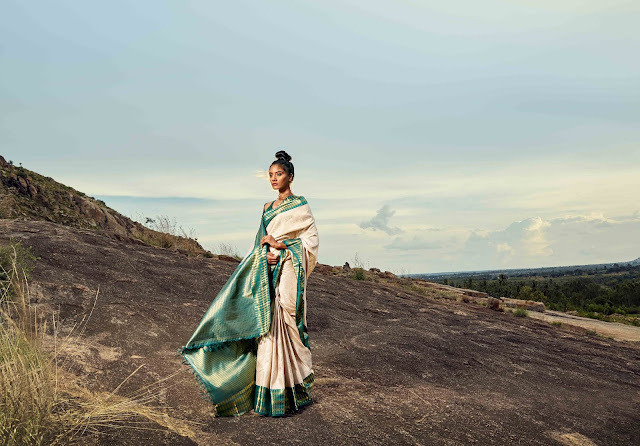 Folklore is her first collection, designed and executed in Kanjeevaram under Palam Silks. Folklore has been inspired from lost indian artworks and architecture. There are motifs that have been popular with kanjeevarams specially for decades. For instance, the paisley, checks and peacocks. But the knowledge about the roots of those designs is pretty scarce. So they wanted to create a design palate based on the creations of rural artisans without any formal education. Sunita wanted to create a design palate to the most traditional fabric of south Indian that is inspired from rural creativity of all platforms, not just apparel. As of now they have worked on 6 exclusive designs for the collection. All 6 are exclusive in their demeanour. The most noteworthy aspect of all the designs is modernity inspite of traditional design decorum. 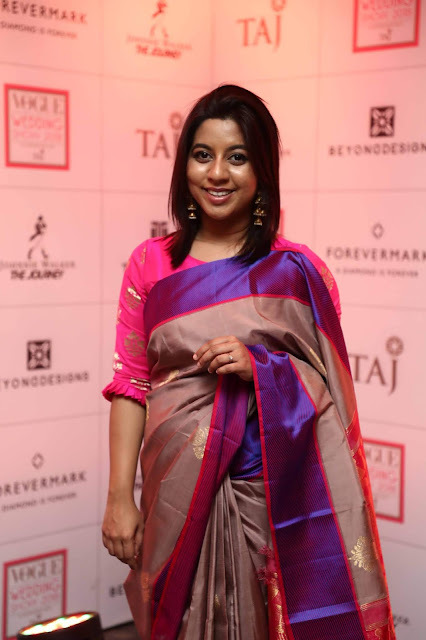 After the entire set of designs were translated to kanchipuram silk, the designer, Ms SunitaYogesh, completely lost the starting point of her thought process. Train of thoughts that began with dissecting india’s creative genes spread from the fabric to even architecture, rural landscapes and even culminated to chalk art on the floors of rural homes. This collection that sprang from knotting silk and motifs in silk threadwork was the foundation of the collection. 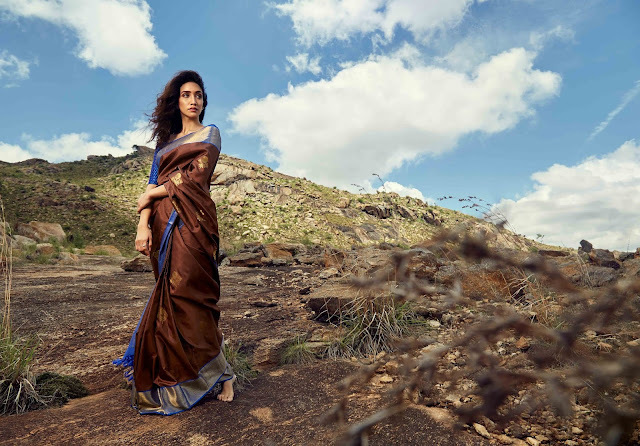 However, a simple communication with the master weaver led to the collection being a traditional silk and zari-motif saree. A collection that was meant to glorify thread weaving testified zari’s dominance on a kanjeevaram all over again. Scroll down to see the glorious collection. 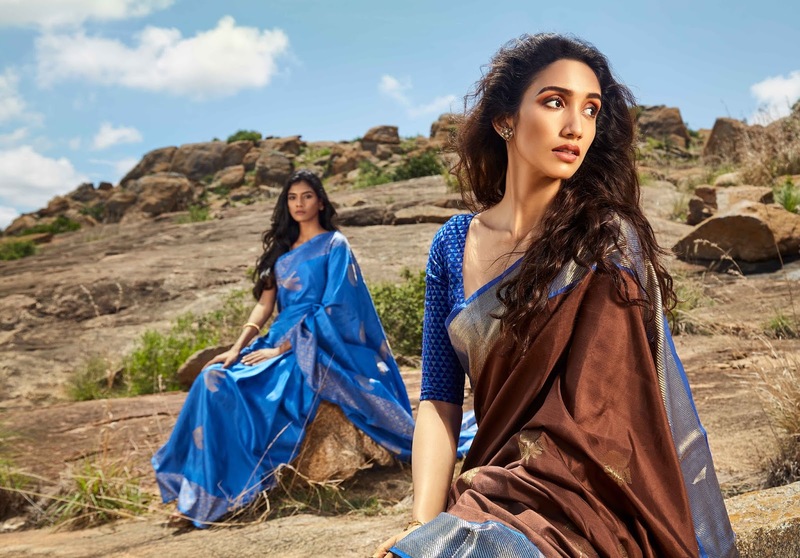 Folklore was launched in the most prestigious Vogue Wedding Show where eminent designers like Manish Malhotra, Sabyasachi, Tarun Tahiliani and Anita Dongre feature their latest creations. 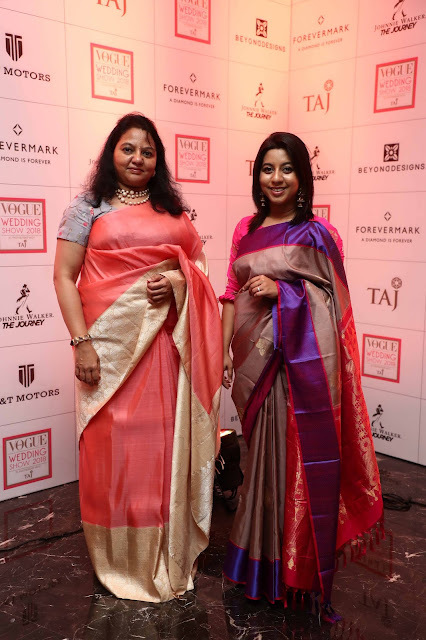 Jeyasree Ravi & Sunita Yogesh shared the space with them, representing kanchivarams from South India. Growing up in a city like Mumbai has its ups and downs. I feel grateful because I grew up at a time when parks and children play areas were plenty even in a crowded city like Mumbai. And even those, who did not have parks close by, had their building complexes which where large enough and clutter free to even host cricket matches. We were blessed because we were not engulfed by technology yet. But decades later, when I became a parent, I felt my kid will miss out on all the fun I had as a child. Playing hide and seek in our building complex, or a game of lagori or even badminton is a distant dream now, as building complexes have been converted into additional parking space. Garden and parks are empty as kids prefer to play games online at home or prefer their mall visits more, compared to play areas. With busier lifestyles, it is becoming more and more difficult for families to spend quality time together and more often I like to blame technology for that. 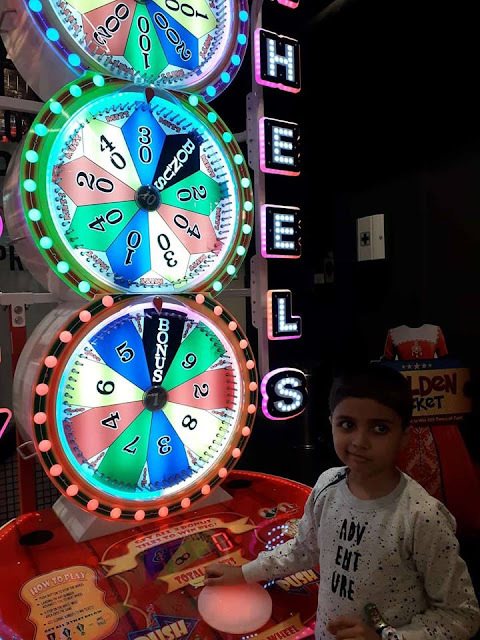 But my visit to #NextGenTimeZone Games at Inorbit Malad changed my perspective and made me a little hopeful for the future. 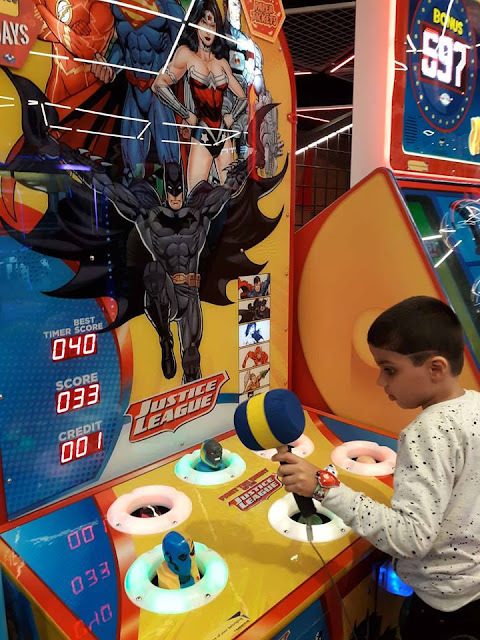 Timezone is your one-stop interactive entertainment destination having latest arcade games, exciting rides and fabulous prizes. It lets you re-live your childhood and make new memories with your family and friends. 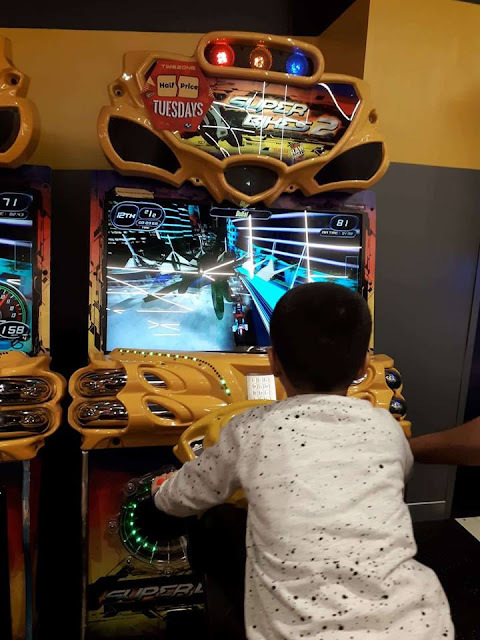 Timezone, has recently revamped and relaunched itself as #NEXTGENTIMEZONE at Inorbit Mall, Malad. This place has elements which focuses on young adults along with kids and family. So this is a perfect place for family bonding. I spent the last weekend with my family there, and I cant believe how much fun we had together. Scroll down to read, what all we loved about this place. Krazee Whirl Cars: Here they have added a fun element to the bumper cars. They have dual joysticks and the base of the cars is LED illuminated. This is one ride that is enjoyed by kids and adults equally. Virtual Rabbids: This concept has been launched in India for the first time. 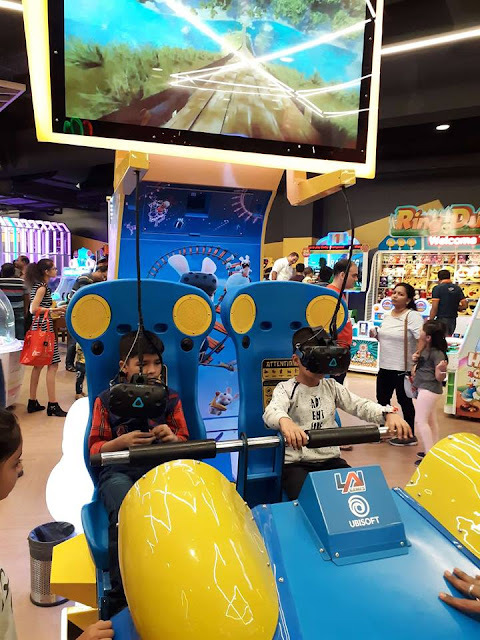 It is a ride which combines virtual reality and makes it fun for kids and families to enjoy together. because even they understand that bowling is best enjoyed with family. The bowling area uses latest graphics and animations which makes bowling even more fun. Fruit Ninja: The game that I really enjoy playing on my cell phone, takes a bigger and better avatar at Timezone. My nephew had too much fun cutting the fruits. And I was happy to see him smile. Prize shop: The Prize shop at TimeZone games is one of the best I have seen lately. It has a huge gamut of exclusive merchandize that comprises of home decor, plush toys, sports, utility products along with confectioneries and soft drinks. 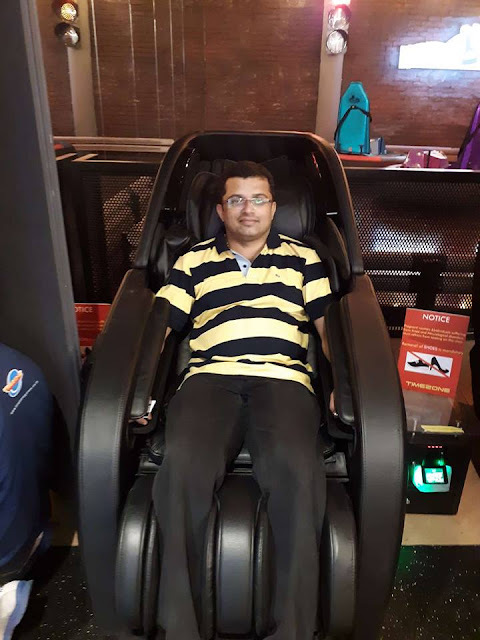 Massage Chairs: One of the best thing that TimeZone has added are massage chairs. When parents run out of energy and kids don't, there are massage chairs that help parents relax and chill. All in all, we really loved the entire experience and realized that we haven't had so much fun together after a very long time. I think this is a perfect place to host birthday parties as they have a dedicated party area. 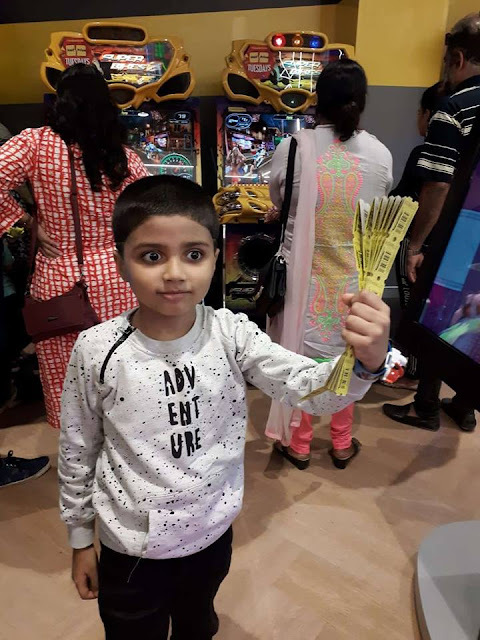 In fact I would even love to host Raksha Bandhan or family get-togethers here, as this place has something fun for every age group. Have you visited Timezone yet? If not, we recommend you totally should. Timezone India is a wholly owned subsidiary of The Entertainment and Education group (TEEG) based out of Australia which operates centres at 250 locations across 7 countries. 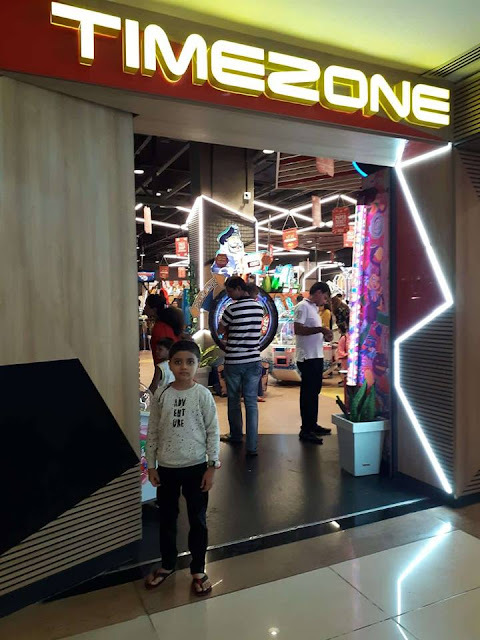 Timezone has 26 stores currently in India located within all the leading malls like Inorbit Malls, Korum Mall, Phoenix Market City etc and is expected to open a total of 32 stores by end of 2018. P.S. 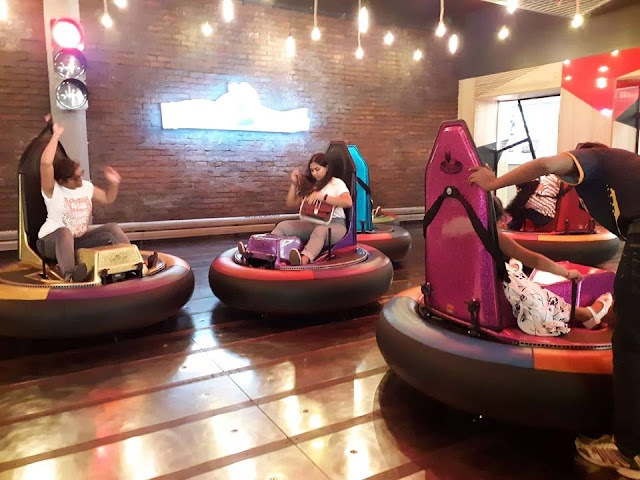 ​"I've shared my experience at the revamped Timezone ​Inorbit ​Malad​ in association with BlogAdda"